Welsh cyclist Ciara Horne is giving up the chance to ride professionally on the Women's World Tour next year in a bid to win an Olympic title. Horne won her first national title in the team pursuit at the National Track Championships in Manchester last week. The 26-year-old says she is leaving her road cycling team in order to turn her attention to the 2016 Rio Games. "This is the right thing for me to do now and put my eggs into one basket and try and make the Games," Horne said. Warwickshire-born Horne, who represented Wales at the 2014 Commonwealth Games, won the national team pursuit title with Joanna Rowsell Shand, Dame Sarah Storey and Katie Archibald. Horne has spent four years working alongside Storey, who has announced her team Podium Ambition will turn professional for the start of the Women's World Tour in 2016. But with just four competitions left to gain selection, Horne insists her main concern is being part of the team pursuit in Rio. 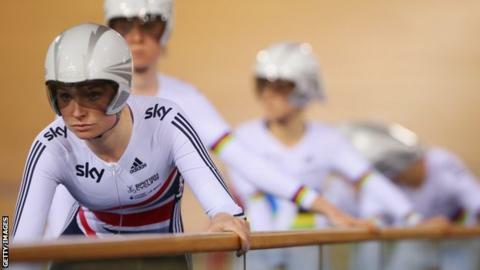 "For me moving forward, the main focus between now and Rio, will be team pursuit," Horne told BBC Radio Wales Sport. "Everything is about going quicker over that 4km distance with the girls. "The smartest thing to do is to focus solely on that and leave the road."